Calgary firefighters have rescued a woman who was calling for help through a window of her home in the city's northeast. Someone called 911 about a fire at 405 64th Ave. N.E., a six-unit residential building, at about 9:10 a.m. Wednesday. When firefighters arrived, they found a woman waving from a window on the second floor. 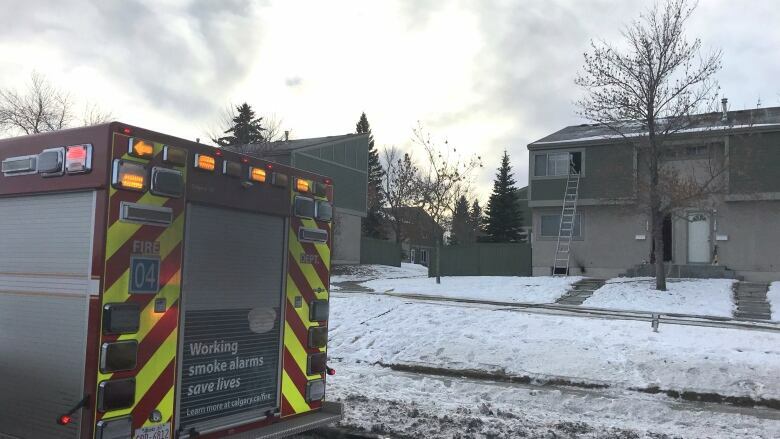 "Her unit was full of smoke so they quickly laddered the building and rescued her out of the window," Calgary Fire Department spokesperson Carol Henke said. The woman was assessed by paramedics, and to Henke's knowledge, she suffered no injuries. No one else was found in the building when firefighters arrived, the department later added, and the fire was soon extinguished. The building had working smoke alarms, but the woman could not get out of her unit safely, Henke said. "Smoke is so incredibly toxic, and really, had she tried to make her way to the main floor in the smoke, the outcome might have been different," Henke said. She says anyone in that situation should close the door to stop the fire from spreading and call 911. She also encourages all Calgarians keep their smoke detectors in working order. This fire is believed to have originated in the basement, Henke said. A fire investigator is working to determine the cause of the blaze but so far, the fire is being considered as accidental. Only that basement unit suffered fire damage, the department said, and a neighbouring apartment has smoke damage. Part of the road remained closed after 10 a.m. to allow firefighters to work on the scene.